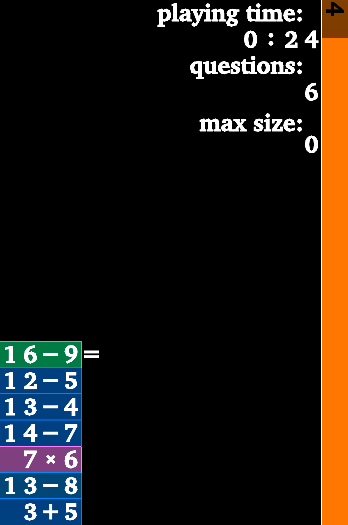 garith is a game similar in spirit to BSD’s “arithmetic” or TuxMath. The game asks you to perform a simple arithmetic operation within a certain time-frame. garith though is geared to improve your skills by stressing the operations you get more frequently wrong or that take longer to answer. The statistics are saved/restored across games, so that each game is tuned for your current arithmetic abilities. This project doesn’t have a fixed release schedule yet. All the relevant source/developer information can be found on GitLab. If you find garith useful, you might also like the Tables dashboard widget for Mac to improve your educated guessing. In the game there’s a stack of blocks (operations) on the left side, and a time limit on the right side. At the beginning of the game the stack is empty and a new block with an operation at random falls from the top, starting the timer. If you answer correctly, the block is removed from the stack, and an old block can be answered again. If your answer is wrong or you reach the time limit, a new block falls from the top, thus increasing the stack size. As the game progresses, the operations which you got more frequently wrong or that took longer to answer are chosen more likely, thus slowly increasing the difficulty. Also, the time allowed for each block converges towards your successful response average, giving you less time to think. When the stack hits the top, the game is over. In practice mode, there is no time limit to answer a block. The only way to lose is to repeatedly give the wrong answer. In medium difficulty mode, the time available to answer an old block is borrowed the from time left answering the last block. Thus, to clear an old block you need to be fast enough to leave some extra time, and think ahead. In hard difficulty mode, you cannot recover an old block. There’s no room for errors or delays. POSIX system (currently tested on OS X and Linux). You can then compile garith by executing make in the source directory. in the source directory, which runs the game in normal playing mode. Starts practice mode, which disables the time limit. Starts a game in medium difficulty, where the time allowed to answer an old block is borrowed from the time left from the previous block. Starts a game in hard mode, where blocks cannot be removed. The default is “+-*/”, which includes the normal four operations. “:” enables division with rest which shows operations such as “13 / 5”, where the quotient (answer) is 2, but with a rest of 3. By comparison, the regular division “/” is always exact. Please note the quotes around the second argument to escape special shell characters. garith is distributed under LGPL (see COPYING) WITHOUT ANY WARRANTY. Copyright(c) 2005-2014 by wave++ “Yuri D’Elia” <wavexx@thregr.org>.